The Dr. Ruth D. Gates Memorial Student Support Fund was established in November 2018 to continue Ruth's legacy of world-class research and efforts to preserve coral reefs in the face of warming seas by supporting the next generation of coral reef scientists. Gifts to this fund will support undergraduate and graduate students researching coral reefs at the Hawai'i Institute of Marine Biology. 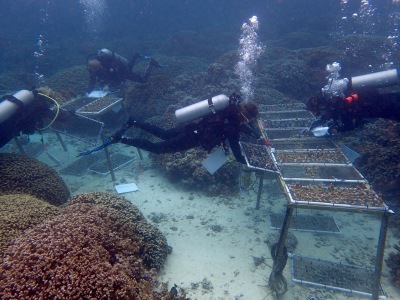 The mission of the Gates Coral Lab is to improve the prognosis for coral reefs by DOING SOMETHING . Your gift to the Gates Lab fund will provide our team at the Hawaii Institute of Marine Biology (HIMB) with valuable resources to perform experiments to enhance coral resilience, preserve and restore coral reefs, and ultimately sustain the important human services that reefs provide.